Whilst some toys are designed for pure enjoyment, others can be used as swimming aids and can help to make learning to swim an enjoyable experience. Floatation aids for example, which can be designed for all ages and are available in a variety of shapes and colours, can be an excellent way to encourage non swimmers to practice their skills. Pool toys really add an element of fun to any pool and are available in just about any shape, colour and style imaginable. Some toys are very inexpensive and can provide hours of fun for young kids. Others can cost a lot more, but may last a long time, and can be suitable for use by much older children (or even adults!). Good quality pool toys should be fun, safe and hard wearing and can be purchased from most swimming pool suppliers and pool shops, as well as from on-line suppliers or larger toy stores. Many regular toys are also often suitable for use in water and can be used as an inexpensive alternative. As well as the toys mentioned below, there are vast amounts of toys available, some of which are extremely fun and innovative. There are lots of pool lighting options, fountains and water features (such as large erupting volcano floats, which can run off ordinary garden hoses), floating boats and cute, floating, convertible cars, which can also help shelter babies and young children from the sun. Please remember, swimming pool toys are not life saving devices – they should never be used unsupervised, or without a responsible adult. Inflatable pool toys range from the simple blow up ball, through to complete water based obstacle courses. As well as the everyday inflatable toys such as floats, rubber rings and inflatable rafts, there are also giant floats (suitable for 3-4 children), inflatable water slides and fun floats with various activities, which can be suitable for all the family. Motorised pool toys include remote controlled boats, battery operated fish, (and other swimming animals), underwater torpedoes and a variety of other toys which can either be navigated along the surface of the water or can travel underwater with the help of a motor. Besides floating pool toys, swimming aids and plastic toys, which are generally very hardwearing, inexpensive to buy and easy to clean, there are various swimming toys and aids which, although not inflatable, are designed to float. These toys can help with flotation and exercise, enabling even the least experienced swimmer to build confidence upon the water. Such toys include kickboards, swim noodles and even plastic weighted toys which sink to the bottom of the pool, providing an opportunity for diving and exploration. Sports pool toys are an excellent idea if you have older children, or would like to get all the family involved. Such toys may include a basketball net, volleyball net or other type of sports toy that is able to provide the whole family with hours of fun and valuable exercise. These work particularly well with in-ground pools, but can also be fitted to, or installed around, most types of pool. 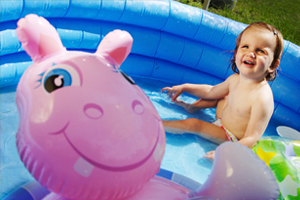 An extensive range of pool toys should be available from all good pool suppliers. You can find a local, independent supplier by clicking the links at the top right of the page, or by clicking here. How do you bring your pool alive? Have we missed any toys you couldn’t live without? Get in touch with your own suggestions using the comment box below.